Unless you spent all of yearly income every year, then 4 years is no good. If a person make about $200k a year, he only spent $50k annually. Then 4 years income saving is $800k which can last 16 years without investment return. 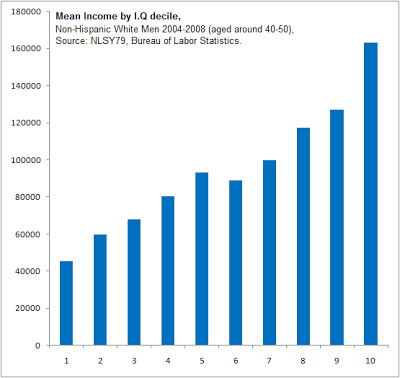 On top of that, there is social sequirity income at about $4k monthly for that income group. It is not bad at all. A culturally technic society ( aka, non intelectual or barbaric society, savage capitalism) that use technic OR unilateral way ( "education" or sweet lies about equality) to promote socially and economicaly a kind of people ( technicians) will have "higher iq" or high functioning technicians earn very well compared with other kind of psycho-cognitive profiles, dispise psychopathic "producers". 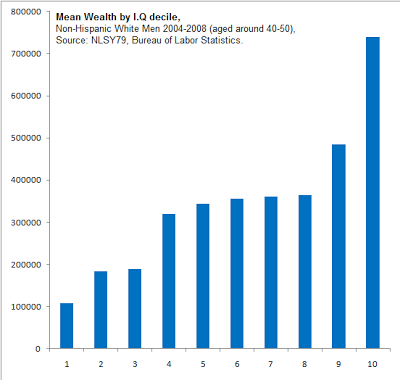 First thing: The idea that 2nd and 3rd decile households were averaging $50K and better is downright absurd. This fails the gut check miserably. One assumes these numbers are 1979 values corrected to 2015 dollars (~12K 1979 dollars, which would be minimum wage for one person then). Second thing: approximately 1/3 of top centile IQs are severely dysfunctional (http://www.cpsimoes.net/artigos/outsiders.html). What say you? ''HBD'' IS a ideology or dogmalogy and its primordial bible is the Terman study. ''Very bright people'' to TEACHER here = ''those who take A+''. The only very bright people are the real geniuses and many them are dysfunctional in a dysfunctional society, but to ''brits'' understand these simplicity, really seems only a miracle... HBD is completely fake. Its over for me!! !